This has certainly been a week of significant events in our archdiocese, the nation and the wider Church. As many of you may already know, earlier this week Caritas Christi Health Care announced an agreement to be acquired by Cerberus Capital Management, a private investment firm. An important part of the transaction will be the agreement that ensures the Catholic identity of the Caritas hospitals. I look forward to reviewing that agreement before giving approval for the transaction and requesting the Holy See’s approval, which is also needed. For a long time, Caritas Christi has been experiencing serious financial challenges, health care has become a very expensive and competitive business. For that reason, I invited Navigant Consulting, who have particular expertise with hospitals and health care, to come in and help us. One of Navigant’s suggestions was that we find a nationwide Catholic health care system to sponsor Caritas Christi. Though we tried that approach, unfortunately, we were unable to reach a mutually acceptable arrangement. The next best option was to enter into negotiations about the possibility of a transaction with a for-profit company, with the goal of attracting investors who would be able to provide the funding that Caritas needs. One of the significant challenges for Caritas at this time is the pension fund that incurred significant losses with the decline of the stock market. It has been a great concern for me that the employees not lose their pensions. At the same time we also wanted to modernize our hospitals, in order that they provide the best possible care for our patients. By way of an agreement with Cerberus, we will accomplish these goals and maintain the Catholic identity of our hospitals, fulfilling the mission of serving the poor and those in need while respecting Catholic medical ethics and the Gospel of Life. Also last week the Holy Father issued his letter to the Church in Ireland, which is suffering greatly with allegations of abuse of minors by clergy. 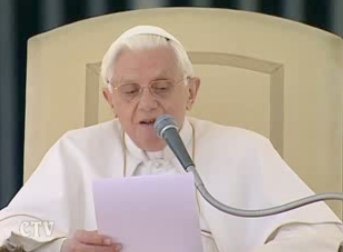 Though the Holy Father had announced he was going to send such a letter, I had no idea it was going to be such a lengthy document. I was very moved by it and I think that the Holy Father tried to touch on all the points and the concerns that people have. I realize that some people have criticized the letter, but I think it was an important step in moving Ireland towards healing. As I read the letter, I couldn’t help but think that I wish we had a similar letter years ago, when this crisis began in the United States. In it, the Holy Father talks about the need of the Church to purge itself of this problem, care for victims and make the Church a safe place for children. He calls on people to accomplish this through spiritual renewal. He has announced a visitation of the dioceses where the problems have been the greatest and calls for a national mission. He also invites the Irish to avail themselves of the sacraments and their faith to overcome and face this problem squarely and to bring about the healing that everyone wants for the Church in Ireland. I am sure you heard, too, that early this week, President Obama signed the health care bill into law after Congress worked late into Sunday night to pass the legislation. In fact, I spent the beginning of this week meeting at the headquarters of the U.S. Conference of Catholic Bishops in Washington. One of the things we did during this time was to work on a statement that was then issued by the president of the USCCB, Cardinal George, in the name of the administrative board, which captures the spirit of the bishops. We have always wanted health care for the poor, but our concern, first of all, has been to safeguard the provisions of the Hyde Amendment as well as the conscience protection for Catholic health care workers. Although we are told these issues are addressed by the executive order the President signed yesterday, we are concerned that this is not an adequate way to deal with such serious matters. For nearly a century, the Catholic bishops of the United States have called for reform of our health care system so that all may have access to the care that recognizes and affirms their human dignity. Christian discipleship means, “working to ensure that all people have access to what makes them fully human and fosters their human dignity” (United States Catechism for Adults, page 454). Included among those elements is the provision of necessary and appropriate health care. For too long, this question has gone unaddressed in our country. Often, while many had access to excellent medical treatment, millions of others including expectant mothers, struggling families or those with serious medical or physical problems were left unable to afford the care they needed. As Catholic bishops, we have expressed our support for efforts to address this national and societal shortcoming. We have spoken for the poorest and most defenseless among us. Many elements of the health care reform measure signed into law by the President address these concerns and so help to fulfill the duty that we have to each other for the common good. We are bishops, and therefore pastors and teachers. In that role, we applaud the effort to expand health care to all. Nevertheless, for whatever good this law achieves or intends, we as Catholic bishops have opposed its passage because there is compelling evidence that it would expand the role of the federal government in funding and facilitating abortion and plans that cover abortion. The statute appropriates billions of dollars in new funding without explicitly prohibiting the use of these funds for abortion, and it provides federal subsidies for health plans covering elective abortions. Its failure to preserve the legal status quo that has regulated the government’s relation to abortion, as did the original bill adopted by the House of Representatives last November, could undermine what has been the law of our land for decades and threatens the consensus of the majority of Americans: that federal funds not be used for abortions or plans that cover abortions. Stranger still, the statute forces all those who choose federally subsidized plans that cover abortion to pay for other peoples’ abortions with their own funds. If this new law is intended to prevent people from being complicit in the abortions of others, it is at war with itself. We share fully the admirable intention of President Obama expressed in his pending Executive Order, where he states, “it is necessary to establish an adequate enforcement mechanism to ensure that Federal funds are not used for abortion services.” However, the fact that an Executive Order is necessary to clarify the legislation points to deficiencies in the statute itself. We do not understand how an Executive Order, no matter how well intentioned, can substitute for statutory provisions. The statute is also profoundly flawed because it has failed to include necessary language to provide essential conscience protections (both within and beyond the abortion context). As well, many immigrant workers and their families could be left worse off since they will not be allowed to purchase health coverage in the new exchanges to be created, even if they use their own money. Many in Congress and the Administration, as well as individuals and groups in the Catholic community, have repeatedly insisted that there is no federal funding for abortion in this statute and that strong conscience protection has been assured. Analyses that are being published separately show this not to be the case, which is why we oppose it in its current form. We and many others will follow the government’s implementation of health care reform and will work to ensure that Congress and the Administration live up to the claims that have contributed to its passage. We believe, finally, that new legislation to address its deficiencies will almost certainly be required. As bishops, we wish to recognize the principled actions of the pro-life Members of Congress from both parties, in the House and the Senate, who have worked courageously to create legislation that respects the principles outlined above. They have often been vilified and have worked against great odds. As bishops of the Catholic Church, we speak in the name of the Church and for the Catholic faith itself. The Catholic faith is not a partisan agenda, and we take this opportunity to recommit ourselves to working for health care which truly and fully safeguards the life, dignity, conscience and health of all, from the child in the womb to those in their last days on earth. 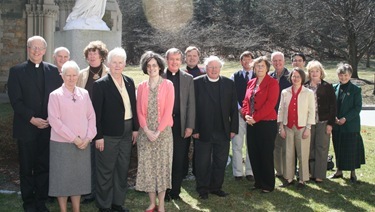 Last Thursday, I met with recently-ordained priests at St. John’s Seminary. I’ve had the custom of periodically meeting with the priests ordained in the last five years for Holy Hour, dinner, and discussion on priestly life and ministry. 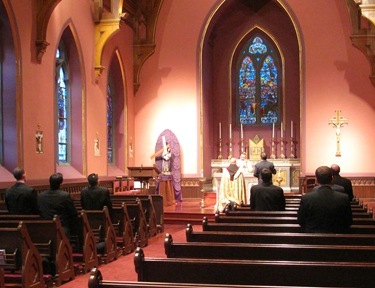 I’ve found this to be a very valuable practice both to be connected to the priests and to help them experience greater fraternity amongst themselves. It’s always a very uplifting experience for me, as well. 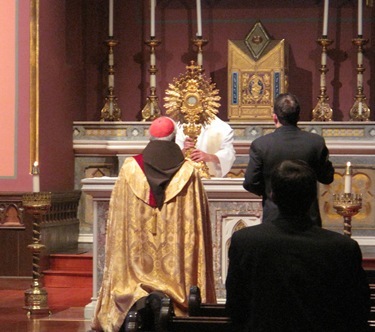 Friday evening, I gathered with a group of seminarians at the cathedral. We have been inviting the seminarians in small groups to come to the Cathedral also for Holy Hour, dinner, and discussion. It’s an opportunity to get to know them in a more intimate setting and to be able to have direct communication with them. I think that they appreciate the opportunity to spend some time with their bishop. 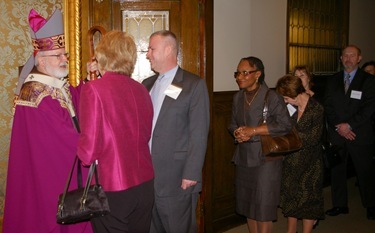 On Saturday, I attended a banquet for the Year for Priests at St. Joseph Parish in Holbrook. Father Riley organized the event for the parish to honor all of the priests who have served there over the last 100 years. There was a Mass and a dinner. Sunday morning, I celebrated Mass at St. John’s Seminary to mark the 10th anniversary of the Master of Arts in Ministry (MAM) program. 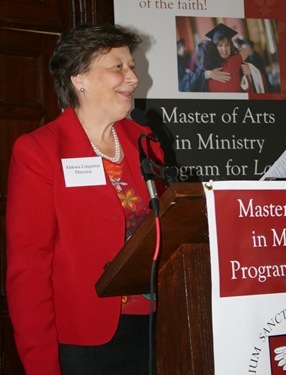 The program trains lay people to work in various aspects of Church ministry. I was the celebrant and homilist at the Mass. I thanked all those who have supported the program, particularly the faculty, seminary rector Father Arthur Kennedy, MAM’s director Dr. Aldona Lingertat, and former directors Father Paul Ritt, Father Bob Oliver, Sister Pierre Jean Wilson and Passionist Father Robin Ryan. I thanked all of them and commented the program has expanded now to the certificate program for catechists and said what a valuable asset that is going to be to the archdiocese. Bishop Malone concelebrated the Mass and gave the keynote at the luncheon. It was wonderful that he was able to attend, since he was very much involved in establishing the program. 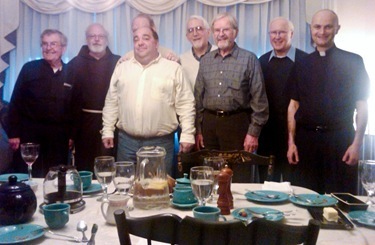 That evening, I had a vicariate dinner with priests at St. Mary of the Assumption Parish in Revere. It is always great to be able to share in the priestly fraternity with my brother priests in small groups and in a casual setting that allows for conversation and sharing. 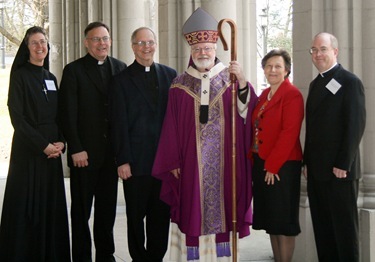 Then I flew to Washington for some important bishops’ meetings. 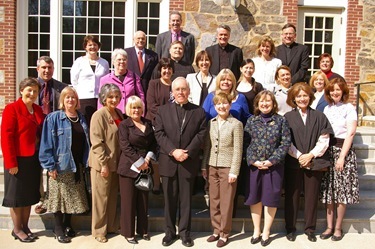 On Monday, I had two committee meetings — the Committee for Clergy, Vocations and Consecrated Life and the pro-life committee. In the evening, I attended a dinner sponsored by the Knights of Malta for the organizations that are working in Haiti. The subcommittee for Haiti to which I belong along with Archbishop Gomez, Bishop Wenski, and Bishop Sansaricq met with the Haitian ambassador, representatives from CRS, US AID, and other emergency relief organizations. We had a dinner meeting that night at the University Club in Washington. The following day, the administrative board meeting began in which we discussed the health care situation and issued the statement that I posted above. During my stay, Msgr. Louis Quinn died so I was able to go to the funeral. Msgr. 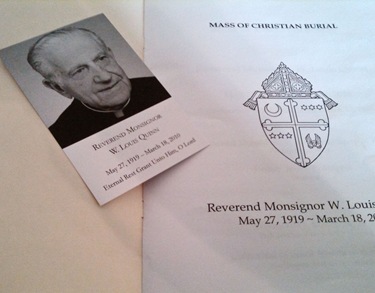 Quinn was at St. Matthew’s Cathedral for decades. He actually went there 65 years ago as a newly-ordained priest as the curate in the parish. At that time, St. Matthew’s was not the cathedral because there was no residential bishop in Washington, it was still part of the Archdiocese of Baltimore at the time. After taking other assignments, he returned as the rector and remained there for a number of years. In addition to his responsibilities at the cathedral, he was also chaplain to the Knights of Malta and the Catholic women’s organizations. He was blessed with extraordinary health and until very recently was playing golf, visiting the sick in the hospital continuously and carrying on his priestly ministry. I worked in that parish for 20 years as a seminarian, deacon and priest while he was there. When in Washington I usually have Mass with the Friars and at Capuchin College, which is where I stay. 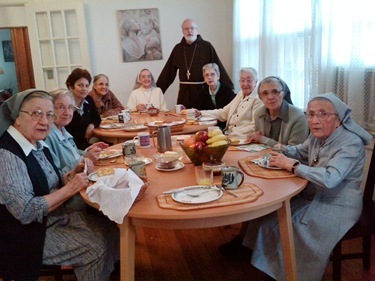 However, on Thursday morning, I had the opportunity to have Mass for the Hermanas Carmelitas de la Caridad de Vedruna. They are a Spanish order and their name translates to the Camelite Sisters of Charity of Vedruna. Their community has made a great contribution to the Church in Washington, particularly working with the immigrants and the poor. It was so good to be able to be with them. 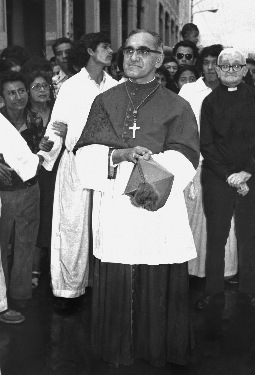 March 24 was the 30th anniversary of the death of Archbishop Oscar Romero who was a very dear friend. His great ministry in defense of human rights resulted in his martyrdom while celebrating Mass. We look forward to the day when his memory will be revered by the Church’s official recognition of his holiness. In the meantime we pray for the Salvadorian people and the Church in El Salvador.